It’s not just about writing our own blog – we also love reading, learning and cooking from other folks’ blogs, too. We have long been fans of the well-established Vegan Dad blog out of Canada. His recipes are creative, thought-out and simple to follow. He’s been posting vegan recipes since 2007. It’s an impressive collection. 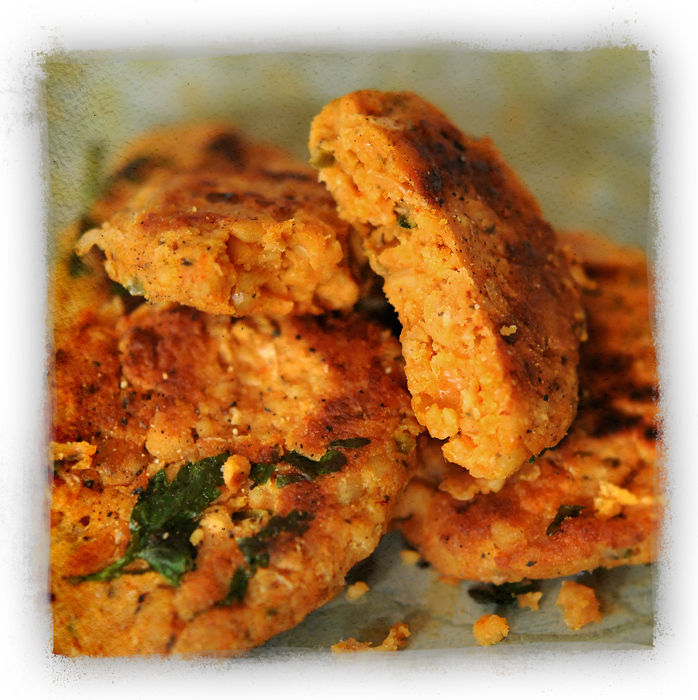 These Crispy Cajun Chickpea Cakes are a savory supper-time treat. They aren’t too spicy, but they have a little kick. They’re super simple to throw together in a food processor. Once they set in the fridge, they hold together perfectly and fry up like a charm. We ate ours with more hot sauce and a little dab of Tofutti Sour Cream. While I can’t repost his recipe due to copyright, I can link to it. And you can go check it out and fry some Cajun yumminess up for yourself. While there’s no “best” time for cookies, there’s just something about cookies in the fall. You know, relaxing with hot chai or cocoa and gobbling up a handful of warm cookies, fresh from the oven. It makes you feel all cozy, right? 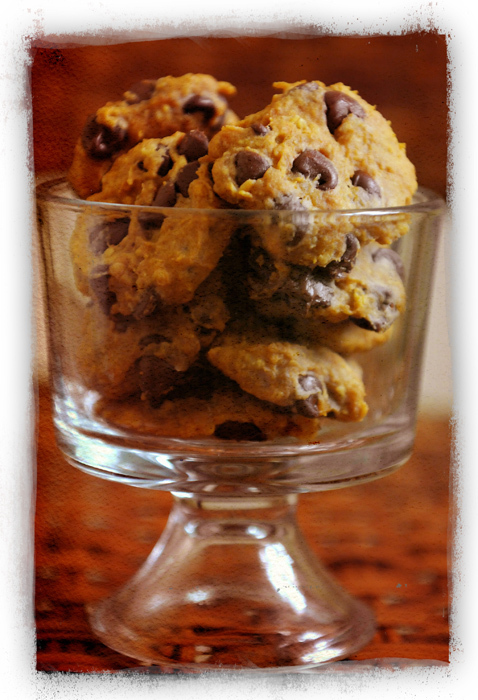 In the spirit of the perfect fall cookie, we offer these tasty Pumpkin Oatmeal Cookies with Chocolate Chips. Mix up a batch tonight – you’ll have cookies to munch on with your cocoa all the weekend long! Preheat oven to 350. Mix together dry ingredients (oatmeal, all purpose flour, cinnamon, salt and baking powder). In a larger bowl, combine wet ingredients (brown sugar, vanilla, shortening, Egg Replacer in water). Be sure you pre-prepare your Egg Replacer, so when you add it, it’s already mixed up. Using an electric mixer (or some old-fashioned arm strength and a wooden spoon), add the dry ingredients to the wet ingredients in three batches. Don’t over work. When it’s smooth, stir in the chocolate chips. Line two cookie sheets with parchment paper. Wet your hands with water and ration out tablespoon-size balls of cookie dough. The dough will be stiff. If it starts to stick to your hands, wet them with more water. Roll the balls of dough smooth and press them flat with your palm for traditional-looking cookies. The recipe makes about 48 cookies. They will not spread when they bake, so you should be able to fit them all on two trays. Bake at 350 for 15 minutes until edges and bottoms are lightly browned and middle is set up. The finished cookies will be orange-ish in color and slightly soft when you bite into them. Ideal for an autumn snack! Mmm! Pickles are always an ideal snack . They’re snappy, zingy and refreshing. And if you get them from B’more Bill’s Dills, they’re insanely fresh. 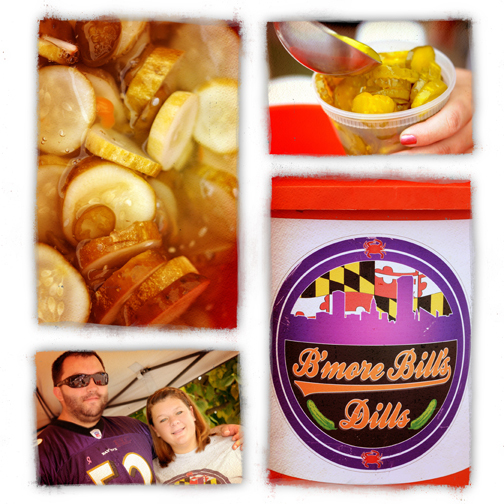 We met the good folks from B’more Bill’s Dills at the Catonsville Farmers’ Market. 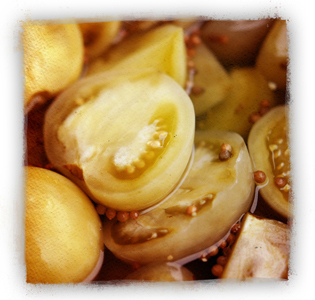 The nine varieties of pickles they offer are impressive, including …kosher dill; sweet and spicy; jalapeno Jewish; fire garlic dill; cracked black pepper & old bay; horseradish Jewish; full sour; half sour and pickled green tomato. The company is owned by Kris & Bibi Kanzlar, from Hampden. It’s an offshoot of Philly Bill’s Dills – Kris’ cousin’s business that started last fall. Kris was visiting with family over the holidays last year, and because Philly Bill’s Dills was going so well, they hatched a plan to start a second company in Charm City. 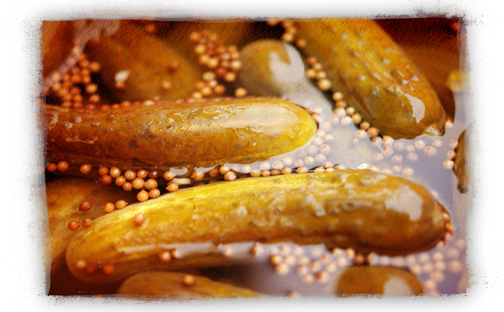 B’more Bill’s Dills started out making 50 buckets of pickles per month, now they make 50 buckets each week! Everyone must know how delicious they are. We sure do. You can get down on some of B’more Bill’s pickles at the Catonsville Market, Waverly Market and at the Rumor Mill Restaurant in Ellicott City – or visit them on their Facebook page. In the future, look for their newest flavor, ginger wasabi. Personally, we can’t wait! Getting ready for Halloween can make a soul thirsty. We have what you need to hydrate. Spooky-boho-style. 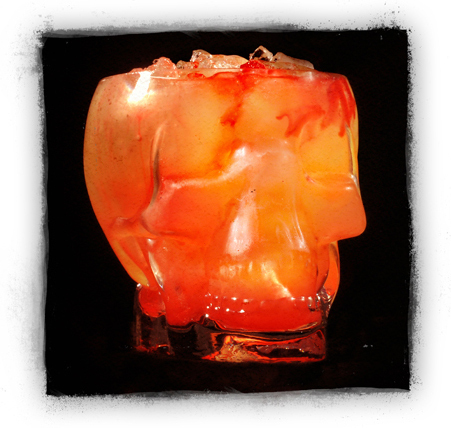 This scary cocktail was created in a very large glass skull. It holds just over a quart of ice and the recipe below. You can make this recipe as one big cocktail, like we did, or mix it in a pitcher and serve in smaller glasses. Add the ice to your large drinking vessel. In a separate glass bowl, measure all liquids and stir up. Pour over the ice. Just before serving, drizzle the grenadine around the inside edge of the large drinking vessel. Share with your favorite grown-up monster. We adore holidays, especially Halloween. But we’ve noticed that this hoilday is also a little bit, well, wasteful. Lots of junky, non-recycle-able decor. Flimsy costumes and masks that fall apart. Piles of candy wrappers. Lots of things that could use an eco-provement. 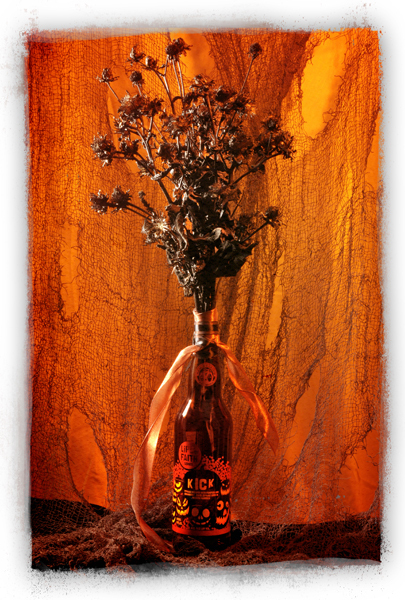 After finishing off this bottle of autumnal beer, Kick, flavored with pumpkin and cranberry, we decided to reuse the bottle. We grabbed some dead flowers from the yard, painted them black and volia — a chilling centerpiece. Super easy recycling. Sip your hot cider or cocoa from one of these adorable jack o’lantern or black bird mugs from Bambeco. They are natural clay earthernware, hand-painted with lead free dyes. Also dishwasher safe – and only $5.00 each! The Green Style napkins are made from 100% recycled paper, 65% post-consumer content and printed with water-based inks. How about some illumiation for your spooky activities? Try this CFL “black light.” We also found them in yellow and red for an eerie glow. And the skeletons are LED string lights, powered by rechargable batteries. Both are widely available at chain stories like Target and Party City. Greener and mood-making. Wear something ghastly… ghost earrings made from recycled A&W root beer cans. These are hand-crafted by artist Dee in California. Wash up after your All Hallow’s Eve festivities with one of these small batch vegan soaps. From the front: Haunted Hayride soap, from Little Egg Harbor Soaps in New Jersey. It’s purple, orange and black with a sweet fragrance. Candy Corn soap by Cassia in Texas is in the middle. A soap that brings you back to childhood and perky color and a fresh, light smell. In the back, cocoa-brown Chocolate Pumpkin soap from you stink soap in Michigan is like a delectable dessert with a lush aroma. Want more eco-friendly Halloween ideas? Check out Green Halloween. The site is packed with eco-ideas for adults, kids, schools, parties and more. And just like that, you have a Halloween celebration to turn every little goblin green. Halloween is one of our favorite holidays. Carved pumpkins, spooky costumes and scary stories step front and center for everyone in our neighborhood. Alas, last fall, I read a scary story I did not care for in Green American. It detailed the ugly side of chocolate candies and unfair labor – specifically child labor. The article quoted research done by the State Department into the process of cocoa farming in Africa. Allegedly, children are traded as slaves to work on cocoa plantations there. Green America has made this information available again on a special link for Halloween 2011. Though I no longer eat milk chocolate, my happy childhood memories of Hershey bars and Reese’s Cups have taken on a sour taste. I grew up not 30 miles from Hershey, Pa and loved their candy, as well as the fun times my family had at Hershey Park. The irony of Hershey – or any company – using child laborers to create treats for other children is beyond a frightening Halloween story. So we set out on another path the past two Halloweens. First we investigated fair trade chocolate. There are quite a few good options out there, as detailed on the Green America chocolate chart. Now, if you only get 50 or so little ghouls at your door, I’d say spring for the fair trade chocolate. It is more expensive than your usual Krackel, but you are paying for ethical labor, which is worth it. Plus it’s fair trade chocolate. It’s delicious, it melts in your mouth, it’s good-for-you and environmentally awesome. But our neighborhood gets literally several hundred trick-or-treaters. We’re talking about 400-ish kids at the door in 3 hours and it would be bad to turn off the light after only 20 minutes – we’d be first in line to get egged. 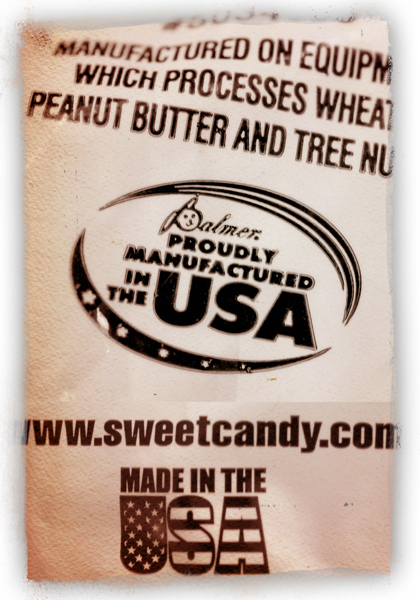 We needed another option and decided to see what candies we could find that were made in the USA. Maybe we could even find some tasty vegan or vegetarian options, too. This turned out to be trickier than we expected. Many companies don’t list where their sweets are made and we had to pass all those products by. After about 40 minutes at the grocery store though, we had several bags of candy in the cart. 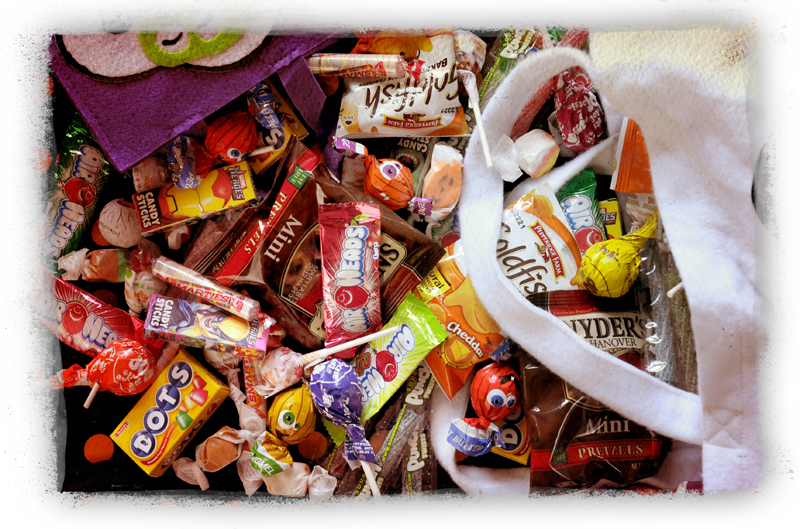 With all these treats, you can now feel much better about All Hallow’s Eve. These products are widely available and easier on the wallet than fair trade chocolate. This list is from our neighborhood chain grocery in Maryland. You may find other great local treats or vegan sweets. Want a fast list of vegan candies? Use this handy list provided by PetaKids or this one from VegNews. It doesn’t note where the confections are made, so you will have to read labels. 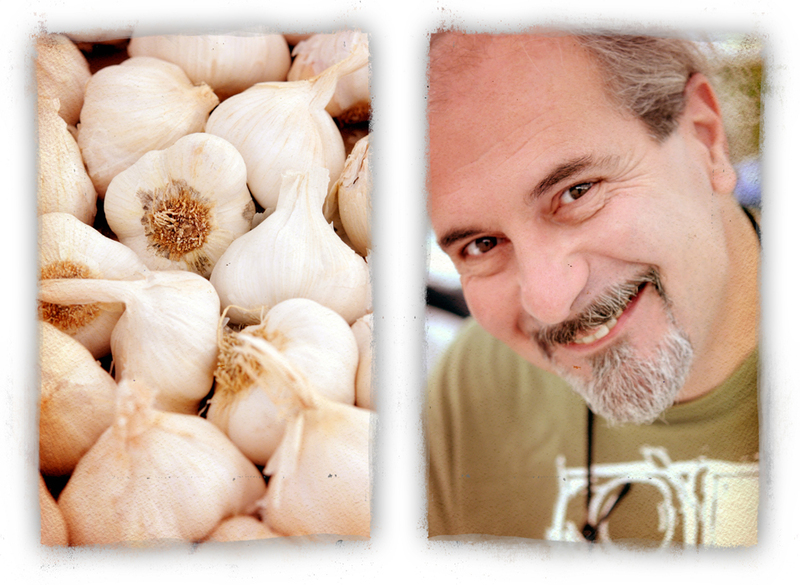 At the Catonsville Farmer’s Market on Sundays, from 10am to 1pm, you can buy locally grown garlic from Natural Nick. Nick started gardening as a child with his father. They gardened together since the 1950s on family land, growing all kinds of vegetables. But, according to Nick, as the climate altered and drought became more common in the growing season, they were prompted to make a change. One year they tilled up the enitre garden, about 3000 square feet, after losing their entire veggie crop. That fall, they planted garlic. Since his father passed away, Nick has maintained the backyard garlic farm on his own. He has a day job as an architect in the D.C. area, but still makes time to plant, weed, harvest and sell the garlic crop entirely by himself. In the 2011 growing season, he grew 11 varieties – all heirloom, which have more distinct flavors and characteristics, he said. His tips for garlic? Don’t keep it in the fridge – cold temps encourage sprouting. The stronger you like your garlic, the less you should cook it. The health benefits of garlic also decrease the more you cook it. And of course… use a lot of it! Visit Nick at the Catonsville Market – or on his Facebook page! And of course, try his recipes below. We loved them! 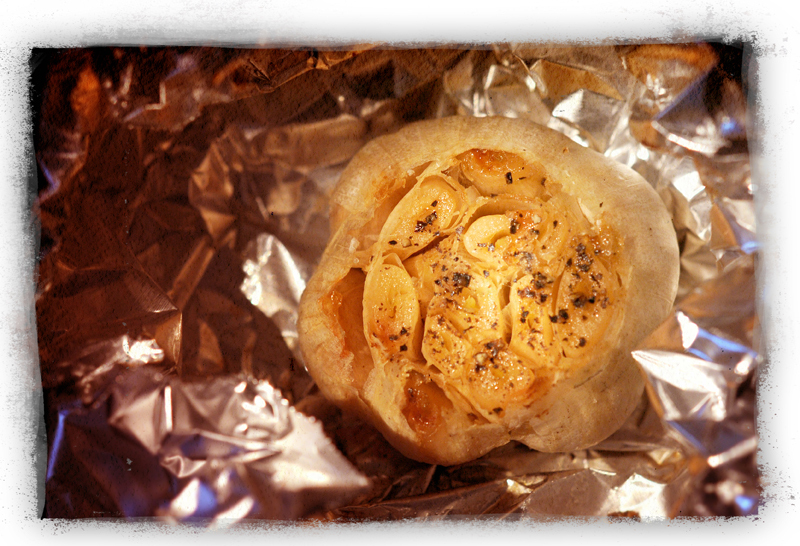 This Roasted Garlic was made with Nick’s Lorz Italian Garlic. It is Italian in origin and was brought to the USA in the late 19th century. Depending on growing conditions, it can be hot and strong. A garlic with a bold flavor that really sticks around. A real garlic lover’s garlic. Allow to cool slightly. Store any leftover garlic in a tight container and use within three days. Avoid storing in the garlic skin. Serving Suggestions: Spread on crackers or warm bread. Top with guacamole. Add to sauces or garlic mashed potatoes. Enjoy with a nice Cabernet or your favorite dry red wine. 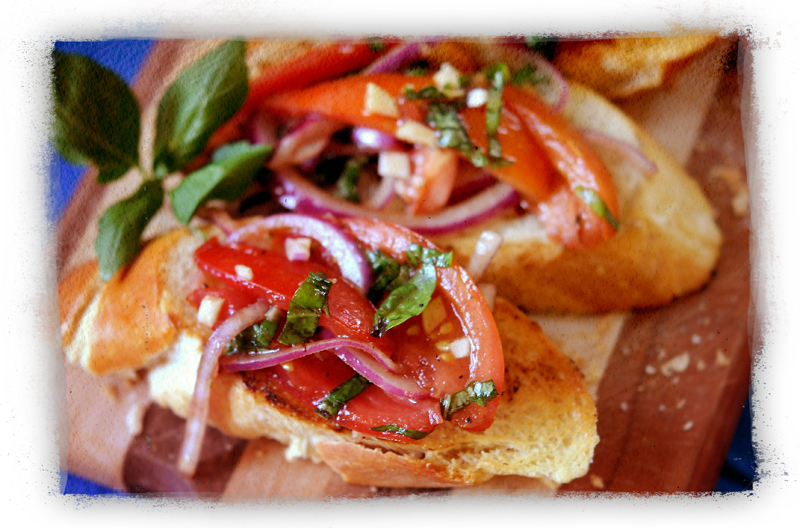 This Bruschetta was made with Nick’s Transylvanian Garlic. Its origin is Romania and it is an heirloom variety brought to the USA in 1994. 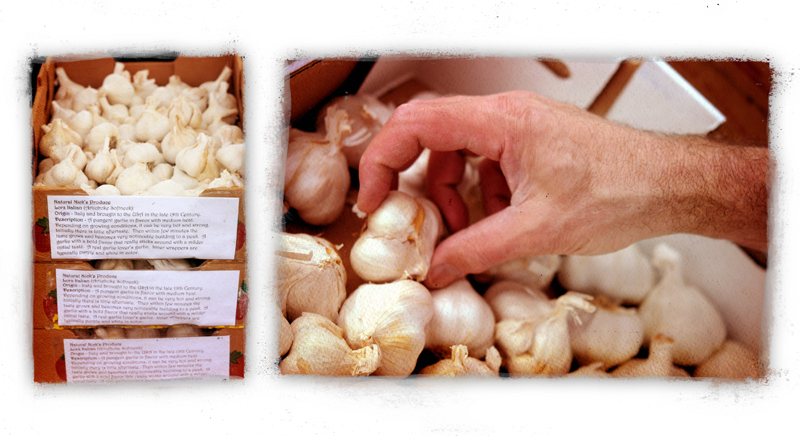 This garlic has medium to large, plump cream-colored cloves with a large flavor and medium heat. This is an Italian staple that dates back to at least the 15th century. It is a regional dish that varies from appetizer to a summer meal unto itself. Different regions prepare bruschetta with many variations. My preferred method is common to peasant regions of southern Italy and Sicily, generally served as a salad or a meal in lieu of a topping, as found in gourmet bruschetta recipes. Chop garlic finely and add to large bowl. Cut onion into long slender pieces and add to bowl. Pour olive oil into bowl, drizzling to cover contents. Repeat with balsamic vinegar for additional richness of flavor. Add chopped fresh basil, salt and pepper. Gently blend all contents and let stand in fridge overnight or at least several hours. Prior to serving, allow to stand on counter in order to bring out the flavor. Serving Suggestions: Serve in a bowl with warm Italian bread or a French baguette. Dunk bread into the juices and enjoy with wine of your choice. This is an excellent summer appetizer or as I prefer, a meal unto itself. 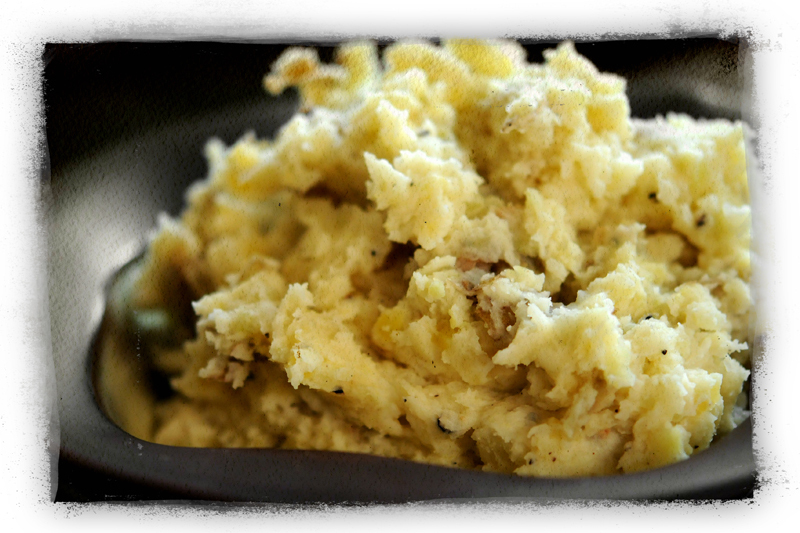 This dish of tasty garlic roasted mashed potatoes was made with Nick’s Siberian garlic. The variety was discovered by traders in Russia in the 18th century. It has purple stripes on the wrapper and moderate heat and becomes more flavorful when cooked or roasted. Place chopped potatoes in a saucepan, cover with cold water and add 1/2 teaspoon of salt. Bring the pot to a boil; reduce to simmer, stirring occasionally. Simmer the potatoes until tender when pierced with a fork, about 15 minutes. Drain the potatoes and put the pot back on the stovetop. Place drained potatoes back in the pot. Squeeze roasted garlic into the potatoes and begin mashing with a potato masher or fork. Gently warm the Earth Balance and soy cream together in a small pan on the stovetop. Over low heat, add the mixture to the potatoes. Add soy sour cream and salt & pepper. Mash again until potatoes are desired consistency and warmed through. Serves about six. 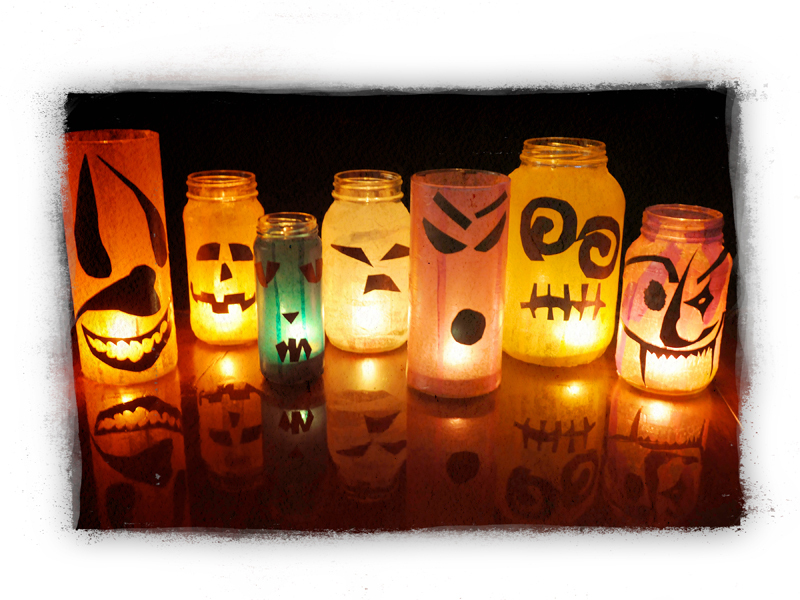 If you have a few old jars around, you are almost ready to make this cool Halloween project. It’s simple and a fun project for big and little monsters. This re-use project first appeared on the craft blog “Not So Idle Hands.” by Emily McDonald. Woman’s Day magazine spied it and featured the cute lanterns on the cover of their October 2011 issue. Super cool. We loved the idea, too and decided to give it a whirl. Here’s how it went. Safely cover your work area before you begin. Measure the tallest jar and cut about a dozen strips of tissue paper to cover the entire jar. In a small bowl, mix 3 parts Mod Podge with 1 part water. Brush the outside of the jar with Mod Podge mixture and lay the strips of paper over the glue vertically (or mix it up – go horizontal!) overlapping each other. Smooth out the paper with your fingers. Let dry. Meanwhile, cut faces or other designs from the black construction paper. Glue onto the jars with Mod Podge, as desired. Apply a thin layer of Mod Podge over the entire surface to seal. Allow to dry completely overnight. To display, light from the inside. Thanks Emily – this is a fun and simple eco-project! Peanut brittle is one of those nostalgic treats. For me, it brings back memories of Easter. My family always had peanut brittle around in the spring. I remember it being part of Easter baskets, and I also remember my Dad eating it before the big day when the bunny came to deliver baskets of goodies. Alas, going vegan meant no more peanut brittle, as our family recipe contained dairy. Imagine my excitement when we found Better Brittle. It’s vegan; it contains no corn syrup; it’s made with fair trade ingredients. And it’s crazy delicious. 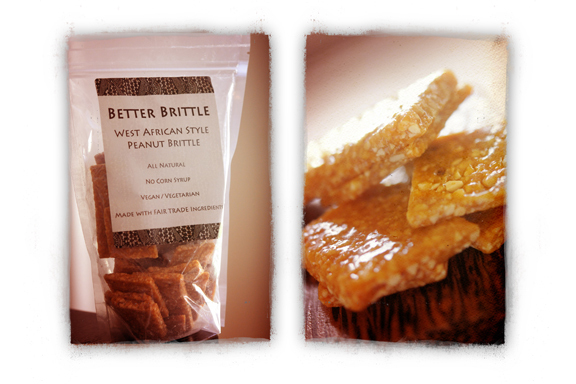 Better Brittle is made from a West African recipe. The owner, Christiana, brought the recipe back from Ghana where it is known as “ntaki cake.” The ingredient list is short and recognizable. The flavor is all the nutty goodness I remember from my family Easter baskets – but in glorious vegan technicolor. You just gotta try it. Visit Better Brittle online and get a bag of your own! After 16 years as a vegan, I can say that I often feel like my food choices are made for me when I eat anyplace but home. If you have more than one or two options on any given menu, it’s exciting – especailly if it’s not a salad or a baked potato. I’m simply not accustomed to having a lot of choices. 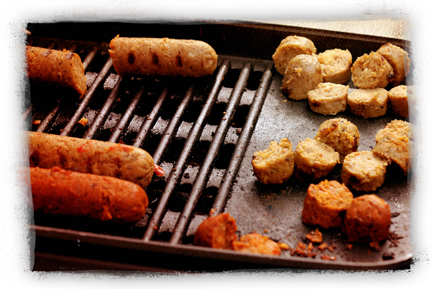 Of all the awesome things about the 2011 DCVegFest, the best –hands down – was all the options of what to eat. There were literally dozens of choices. It was overwhelming. I didn’t know how to pick. We wandered around the stands for almost two hours before either of us could commit to a selection. 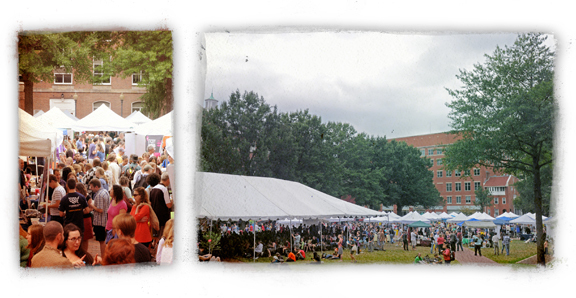 The 2011 DCVegFest was held from 11am to 6pm on Saturday September 24 in a green area of George Washington University. According to the website, over 6,000 people attended. Having been there, I can say it was VERY crowded and many of the food vendors were selling out. So… what did we eat? We started with a vegan stromboli from Stickyfingers. And while you’re at Stickyfingers, you have to have a sweet bite too. 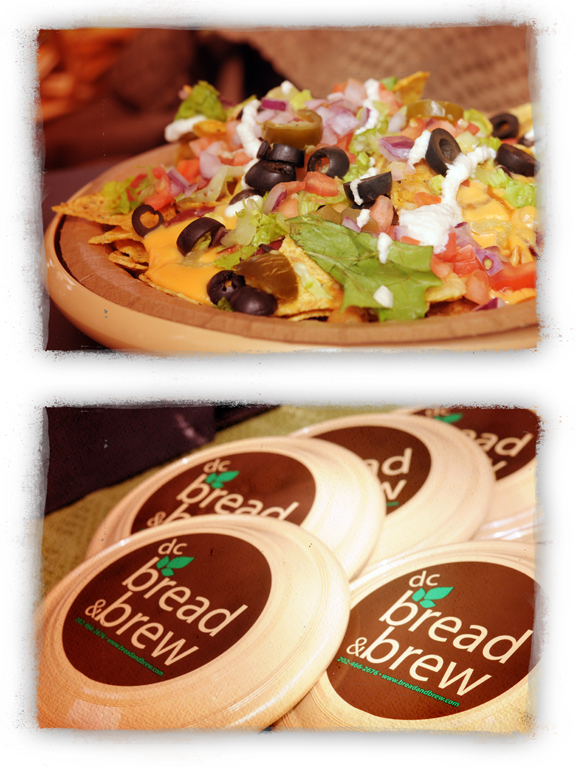 Next, a huge plate of nachos from Bread and Brew. These were insanely delicious and the cheesy Teese sauce was perfect. 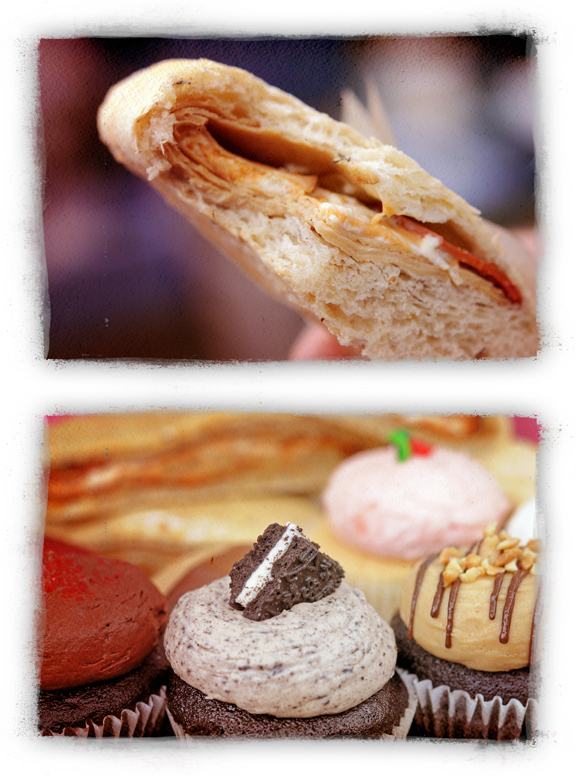 We had to have some more sweets, so we stopped by the table for Vegan Treats Bakery from Bethlehem PA. Though the choices were daunting, we settled on a pumpkin cheesecake. Yea, it was seriously good eating. We snacked on kale chips, Primal “jerky” strips and Field Roast Samples. Even our hound got some pumpkin and molasses dog cookies from Max & Ruffy’s. For the road, we got a huge vegan take-out container from Sweet & Natural packed with mac & cheese, spinach lasagana, Memphis-style BBQ tofu and Veggie Fried Chicken. We also shared some of their refreshing ginger lemonade. All that and we missed so many fabulous food options… there was Indian, Ethiopian, falafel, burritos, fresh juices, pastries, pie and cookies, and more. As soon as the date and location are posted for the 2012 DCVegFest, you can bet we will mark our calendar and keep the day open. Wouldn’t miss it for all the tofu in the world!